In days of old, rubbish bins were small and kept behind fences. On collection day, the nice men would come and collect them, empty them into their trucks and leave them back behind closed gates. Now it is not good enough to have one small bin, we must all have at least two large ones (one for recycling) a sad reflection on the amount we consume, and the amount we waste. 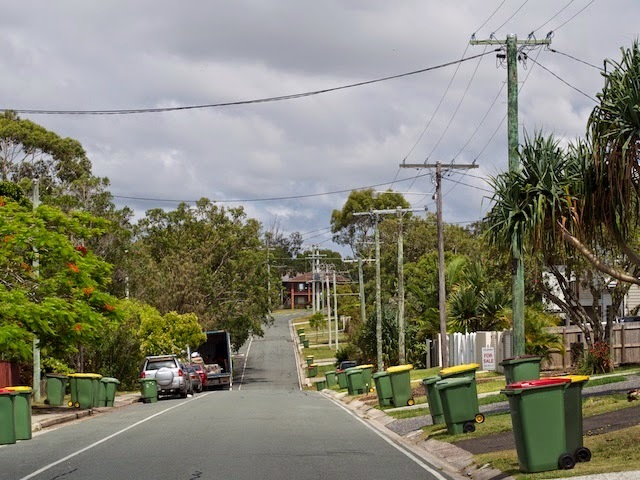 The combination of power lines and wheelie bins do not make a terribly positive statement in the streetscape, thank goodness for the trees opposite. We have very similar bins for our compost items.